Hi everyone!!! 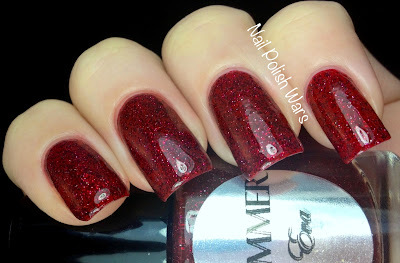 I'm so excited to be showing you some amazing little gems from Shimmer Polish!! 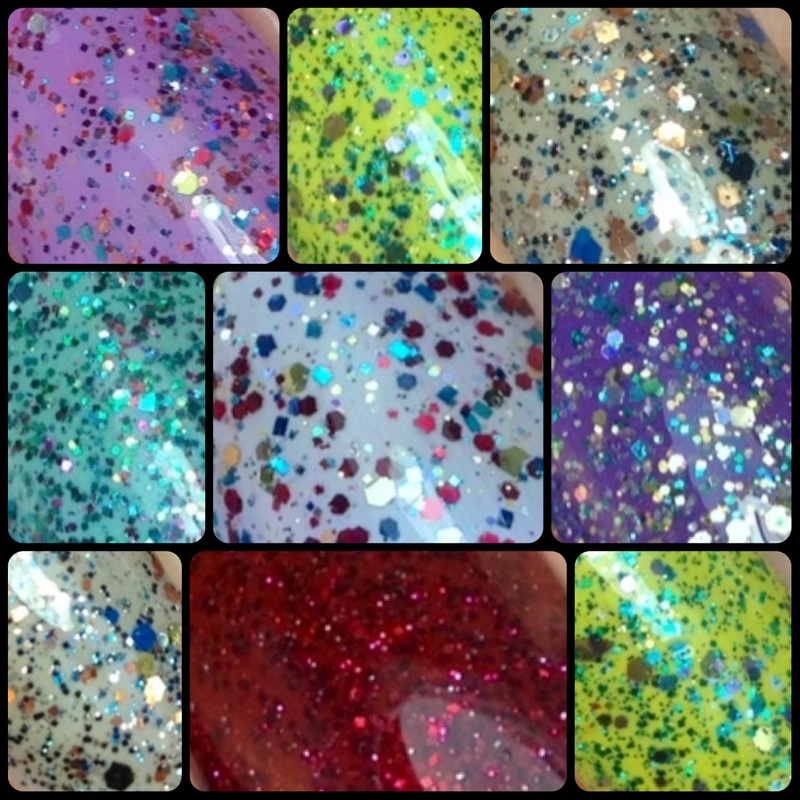 So here is part one of a three part swatch fest!!! 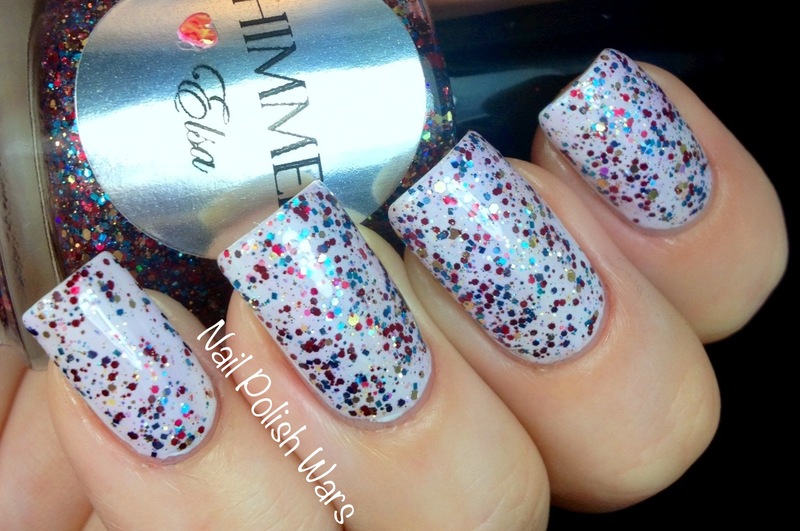 Amy is a clear coat, with a slightly pink tint, loaded with a rainbow of micro glitters. It has a great forumla, and was super easy to apply. The slight pink tint to the polish did give my base color a whole new look, which was a nice surprise!! 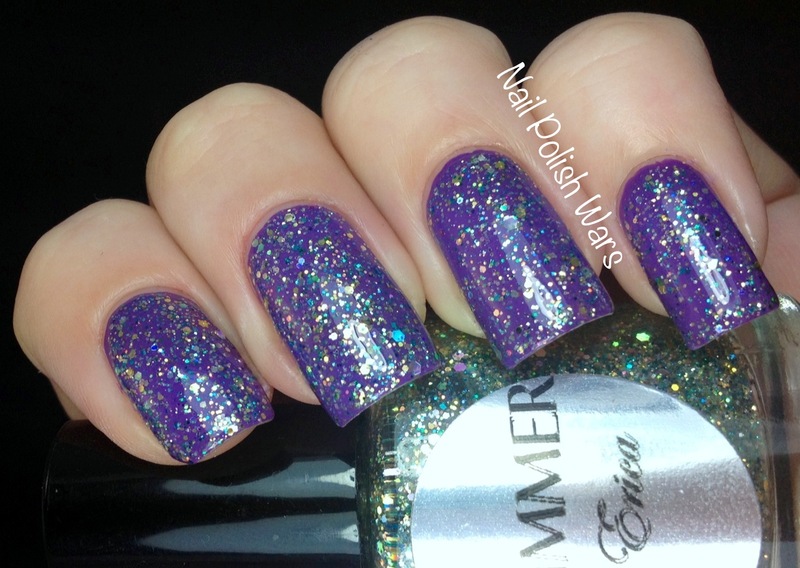 Shown is one coat of Amy over Nubar Lavender. 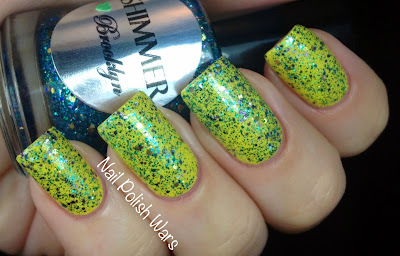 Brooklyn is a clear coat loaded with blue, green, gold, and purple mini and micro hexes. The formula was smooth and easy to apply. Shown is one coat of Brooklyn over Sally Hansen Mellow Yellow 360. 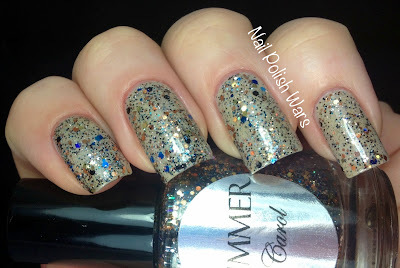 Carol is a clear coat loaded with blue, black, silver, gold, and slate mini and micro hexes. The formula was super easy to apply. I am absolutely over the moon with this one! The color combination isn't something you see too often with glitters, which makes it so amazing to me!! Shown is one coat of Carol over OPI Skull & Glossbones. 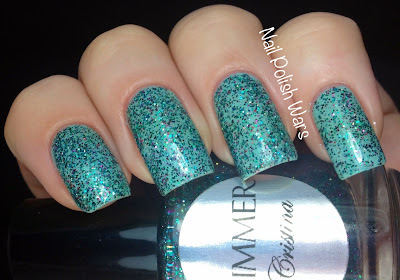 Cristina is a clear coat loaded with green, teal, red, and fuchsia mini & micro hexes. Again, another smooth formula. 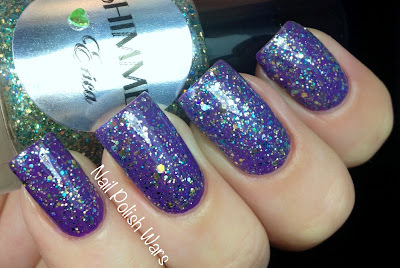 Shown is one coat of Cristina over Sinful Colors Be Happy. Elsa is a clear coat, with a slight red tint, loaded with teal, blue, red, and gold mini and micro hexes. 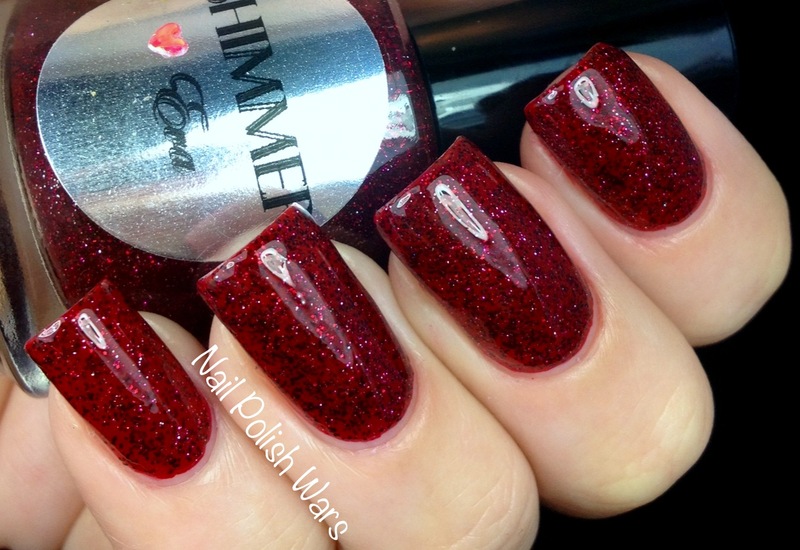 Not only is the formula great, but the red tint really brings your base color to a whole new level. This is probably my favorite of the day! Shown is one coat over OPI My Boyfriend Scales Walls. 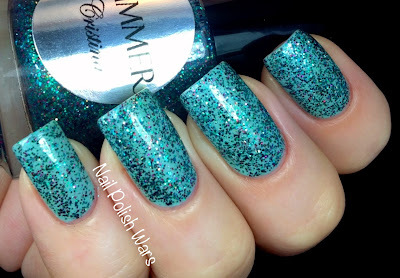 Erica is a clear coat loaded with green, gold, silver, blue, and peridot mini and micro hexes. The formula for this one is easy to apply, but does have a bit of a cloudiness to it, so my base color became a bit more muted. Shown is one coat of Erica over Zoya Mira. Eva is a deep red jelly loaded with burgundy, black, and silver micro glitters. The formula was smooth and easy to apply. Shown is one coat of Eva over Zoya Rekha. I hope you enjoyed the first installment of my Shimmer Polish swatches! I know I did!!! 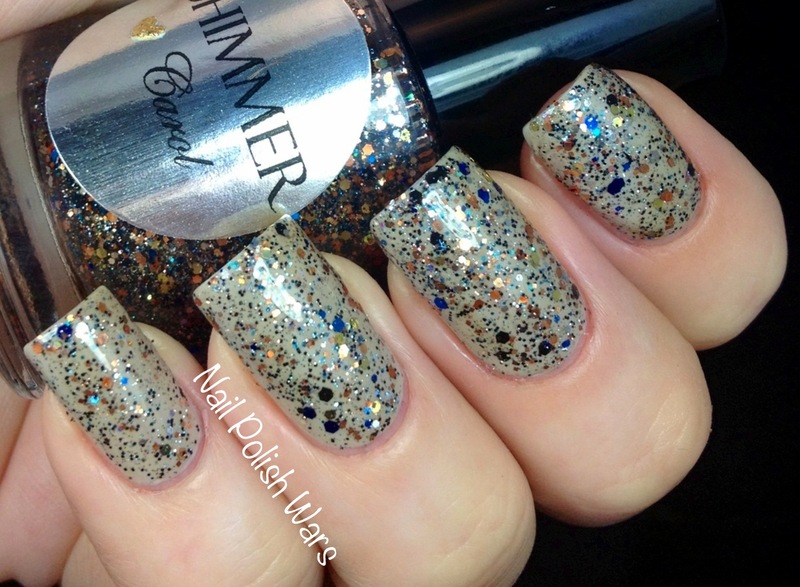 Shimmer Polishes can be purchased here! Be sure to check them out on Facebook to stay in the know!! I think I need "Carol"!!! I TOTALLY have to get Erica! Nothing is ever named after me, and with the right spelling :D LOVE IT!